Welcome to the GoS: v18! Welcome to A Game of Stones: V18.4! This is the 19th full version of GoS I've released in the last 10+ years, but there is still more to come! No significant changes made since last age. Please report all bugs or behavioral issues to me on the forums and if you have any questions check out the wiki, or just ask. Thanks and please enjoy the game! Please visit the forums for the latest progress and news! 1. What is "A Game of Stones"? 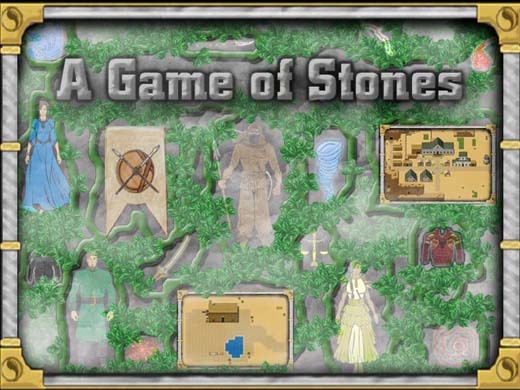 A Game of Stones is a browser-based Massively Multiplayer Online Role Playing Game (MMORPG) set in the universe of Robert Jordan's Wheel of Time series. You control your character as he/she duels other players, battles NPCs, and completes quests. You can form 'Clans' with other players and compete to take over towns from other clans. As you complete tasks, you gain better skills and better equipment, struggling to be known as a Hero of the Horn. 2. What with the name? I don't see in Stones in this Game? The name comes from the strategy board game 'Stones' within the WoT universe. I know there are no actual stones in the game, but hey, I didn't name it. 3. Wow! The setting/NPCs/weapons/classes etc sure are creative? Did you come up with these? No. The setting, a large majority of the NPCs and items, classes, and a lot of other elements are derived from the work of Robert Jordan. While I'm not going to say Jordan created the idea of using 'Swords' or fighting 'Bears', I've tried to only include elements found in the Wheel of Time series or elements that are likely to appear in such a setting. Any emulation of these ideas are done purely as the work of fan. 4. I haven't read any of the Wheel of Time books. Can I still play? Will I be overly confused? Of course you can play! The Wheel of Time source material is used primarily for naming conventions, but most gameplay elements are comparable to other RPGs, if only called another name. 5. "In the Wheel of Time world, doesn't make sense! It should be more like..."
I try hard to keep as true to the books as possible, but at some point I have to draw a line to keep the game balanced. I also try to include as much WoT elements to the game as possible, sometimes at the cost of continuity. Yeah, a channeler would likely be able to manhandle any non-channeler in a straight duel, but if channelers were that powerful the game would be unbalanced to the point of negatively effecting the game. Balancing WoT continuity and gameplay is something I try my best at though. 6. I don't understand how works? If you ever have a question, I'd suggest first checking the GoS Wiki page. It has a lot of basic information that may solve your problem. If that doesn't help, start a thread on the forum asking. Other players (myself include) check in there regularly and someone there should be able to answer your question. Or simply post your question in Tel'aran'rhoid, as many of the veteran players are quick to help others. If all else fails, shoot me a PM and I'll get back to you as soon as I can. Yeah. I know. I'm working on trying to keep it more up to date, but when it comes down to documenting how stuff works or making changes to the game to make it better, coding usually wins for me. A GoS Wiki has been created, so if you wish to share your knowledge of the game and how it works, it'd be much appreciated. 8. Ok. You've sold me. Now how much is this gonna cost me? Nothing! The game if FREE to everyone. I will mention that those who donate (see the 'Donate' button to your left...) to the game do get a few perks, but nothing that give their characters any major advantages over non-donators. Mainly little options to make the game easier to manage. 9. What made you decide to make this game? Actually, I didn't. It was started by Craig Harrison, who worked on the game well before I did. I just happened to play the game and really enjoyed it. When Craig decided to call it quits back in May of 2008, he was nice enough to let me have the source code to the game and carry on the torch. A few others got the source code as well, but I'm not aware of any other sites actively using it right now. 10. Love the graphics! You rock! Thanks, but I didn't do them (you likely wouldn't be loving them if I did...). The original game graphics were created by Aaron McCollough, though most of the current graphics are the work of Edward Givens. So pass your graphical feelings his way. 11. I love this game! What can I do to help? Wow! So nice of you to ask! The biggest thing you can do is spread the word about the game. The more players we have, the more fun the game can be. I'm also very open to suggestions for game improvements. That's where most of the changes come from. I figure you guys are the ones playing the game, so it might as well be as close to what you all what anyways (within reason). If you REALLY want to help, there's always updating the Wiki to include more detail. The better the descriptions of what to do are, the easier the game will be for people to pick up. Plus I do accept donations to help with the costs of running the site. If you want to do even more, come to me and we can talk. As nice as it'd be to have a second (or tenth) pair of hands working on coding game improvements, I'm pretty content right now doing the work myself. Smaller teams are much easier to manage. Maybe someday I'll build a team to do the work, but I'd probably be a little hard pressed right now. This is a hobby for me. 12. I love the idea of this game! What do I need to do to make one myself? 13. I think I found a bug in your game! Then please let me know on the forums. I can't fix them if I don't know about them. 14. Thanks for making this game! You're very welcome! Go Team!